On July 7, 2014, the Permanent Court of Arbitration based in The Hague, handed over its much-awaited verdict on the maritime dispute between Bangladesh and India. Bangladesh, like Pakistan, is a country heavily dependent on the sea. The country had serious differences with India and Myanmar on maritime boundary issues. Having failed to resolve the issues bilaterally, it opted for third-party arbitration. The final decisions on both the cases are generally considered favourable to Bangladesh. How did Bangladesh manage to get favourable decisions on both cases from different arbiters? The International Court of Justice at The Hague, the Netherlands. The International Tribunal for the Law of the Sea (ITLOS) at Hamburg, Germany. The Permanent Court of Arbitration (PCA) at The Hague, the Netherlands. The controversy began when, in 2008, Bangladesh claimed a sizable block of sea for oil exploration deep in the Bay of Bengal. 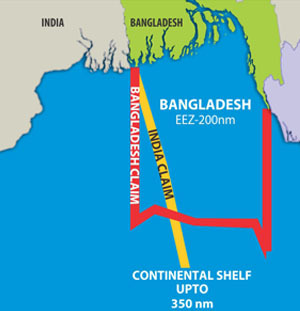 The area announced by Bangladesh overlapped the claimed Exclusive Economic Zones (EEZs) of both the neighbouring countries, and therefore, attracted opposition from India and Myanmar. Bangladesh, realizing the importance of the issue for its future maritime endeavours, and aware of the hiccups involved in bilateral dispute resolution, decided to opt for international mechanisms available under the existing laws and submitted its case for resolution of its maritime boundary with India in PCA on October 8, 2009. A little later, in December, it decided to take on Myanmar in ITLOS. On March 14, 2012, Bangladesh won its case in the ITLOS in which it was awarded an area of 111,000 sq. km. of EEZ against the original claim of 107,000 sq. km. Having won its case against Myanmar strengthened Bangladesh’s position and, finally, on July 7, 2014, the PCA also declared its verdict, in which the tribunal awarded almost 4/5th of the disputed waters, i.e., 19,467 sq. km. out of the total of 25,602 sq. km. (an area equal to the size of Indian state of Bengal) to Bangladesh. It may be noted that India has always emphasized on bilateral mechanisms for resolution of problems with its smaller neighbours. It has always stood against international/third-party involvement, particularly in the case of Pakistan. However, Bangladesh not only managed to convince India to accept third-party arbitration, but also won its case favourably. The acceptance of arbitration by both the parties means that the verdict is final and binding. It cannot be challenged in any other forum; however, the parties may refer to the tribunal for clarification in interpretation of the verdict. Bangladesh managed to achieve this success only because it took the task seriously and did its homework correctly. The Bangladeshi team was headed by its foreign minister herself and a retired admiral from the navy who was appointed as an Additional Secretary in the ministry solely for this purpose, besides a team of more than two dozen experts. After resolution of this issue, India has now resolved its maritime boundary with six out of seven neighbours, Pakistan being the only exception. The resolution of maritime boundary issue with Pakistan has been delayed so far due to lack of agreement on land boundary terminus in Sir Creek. Ironically, while India used historical records (Radcliffe Award) to fight its case against Bangladesh, in the case of Pakistan, it has refused to accept previous verdicts. According to historical evidence, land boundary dispute in Sir Creek areas was settled between the then state of Kutch and the Commissionerate of Sindh through a resolution dated February 24, 1914. The boundary on the maps is shown by a green line from the mouth of the Creek running along the eastern edge of the Creek. However, at the time of demarcation of the land boundary in this segment during 1969, the Indian authorities reneged on the agreement and claimed the boundary to be running along the western border (Pakistani side). During later talks, the Indian delegation changed their stance and asserted that the boundary ran in the middle of the Creek. Since then, the Indian position has fluctuated between the two claims. However, of late, the two sides have submitted their proposals for extension of continental shelf despite the pending issue of Sir Creek. This means that only a small portion of the Creek and the adjacent sea will remain to be resolved later. In 2012, when news leaked that the Sir Creek issue is about to be resolved, Narendera Modi, the then Chief Minister of Gujarat threw a spanner in the talks by protesting against it. Since Mr. Modi has now become the Prime Minister of India, the fate of the issue has become doubtful. Maritime or land boundaries are not the only issues. Pakistan has also suffered at the hands of India on other issues, most prominent of them being construction of dams by India on rivers allocated to Pakistan through the Indus Basin Waters Treaty. Some observers are of the view, the treaty provides a mechanism for third-party resolution, Pakistan has always delayed taking the issues to the international arbiters losing precious time and the verdicts have generally not been favourable. Why Pakistan is reluctant to opt for third party arbitration. While the Simla Accord between Pakistan and India is one reason, it is believed that the Pakistani bureaucracy is reluctant also because they know they will lose the case. It was obvious in both the Baghliar and Kishinganga cases that Pakistan could have achieved more favourable results only if the cases were moved in time and with due preparations. The recent success of Bangladesh has been heralded internationally as a sign of peaceful resolution of disputes. It also shows that even weaker nations, with lesser international clout, can achieve victory in international fora, if they are serious in protecting their national interests and do their homework religiously and honestly. The Protection of Pakistan Bill has finally been passed by both the houses of Parliament. This much hyped Bill was first presented in October 2013 in the National Assembly by the name of Pakistan Protection Ordinance, but the government was not able to get it passed due to some controversial clauses which were heavily criticized and slammed by both the media and the civil society. This Bill, however, was then amended and named Protection of Pakistan in January 2014. The Protection of Pakistan Bill was then presented in the Senate and was passed unanimously. Then it was tabled in the National Assembly on July 2, 2014, and there too it was accepted, thus making this Bill into an Act of law. It is applicable for the next two years. The critics of this legislation have declared it to be in clear violation of not only the Constitution of Pakistan but also to be against the United Nations Convention against torture. For example, it allows any law enforcement official of Grade 15 and above to shoot anyone he/she suspects to be a terrorist. The officials (armed and civilian), under this Act would be allowed to “enter and search, without warrant, any premises to make any arrest or to take possession of any property, fire-arm, weapon or article used or likely to be used…” Moreover, the Act enables the authorities to hold an individual in detention for a period of up to 60 days without presenting the detainee before a court. The Protection of Pakistan Bill calls for the creation of special courts and Joint Investigation Teams consisting of armed and civil forces to hold investigations against those accused. The forces would have to inform the special courts about the location of their investigative centres. The suspects held under this Act would be not be granted bail, and “A person arrested or detained under this Ordinance whose identity is unascertainable shall be considered as an enemy alien.” It means that if a person cannot prove his/her identity, and their neighbours fail to recognize them, he/she would be considered an “enemy alien” who is waging war against the state of Pakistan unless he/she can prove otherwise. The Act also states: “acts that are calculated to influence or affect the conduct of Government by intimidation or coercion, or to retaliate against government conduct” are also punishable under this Act. It means the government can crackdown on legitimate protestors and processions under the cover of this law and use it as a means to achieve their own political objectives, thus hampering people’s democratic and constitutional rights by legalizing unchecked use of violence by the State and legitimizing State oppression. It is not too far-fetched to speculate that the Act would create impunity for the State to hold people in illegal detention which could result in an increase in the number of cases of missing persons in the country which would further create chaos and instability in the country. This bill violates the fundamental human rights like the freedom of speech as one of the scheduled offenses state “crimes against computers including cyber crimes, internet offenses and other offences related to information technology etc”. This clearly states the underlying agenda of the government about how it wants to restrict and control the cyber space. Freedom of speech is guaranteed in the United Nations Charter of Human Rights. If the authorities think the state can strip its citizens of their opinion and their voices then they are gravely mistaken as such tactics adopted to terrorise its citizens have not worked before and will not do so even in the future. On the other hand, proponents of this bill argue that in these testing times especially in the light of the on-going military operation in the country, the bill was the need of the time. They are of the view that in the light of the current ground realities of Pakistan, the constitution does not embody full punishments and the methods to deal with the terrorists and this bill provides with a way to apprehend these terrorists. All in all, it is pertinent that the government ensures that this law is not used for perusing personal vindictive agendas and to carry out extra judicial killings. However, it should be kept in mind that what benefit this Protection of Pakistan will have when the other laws pertaining to maintain the law and order situation in the country are not fully enforced. When the trials are delayed and there is no accountability of the executive then it would not be wrong to say that such laws or bills will not make a significant impact in the longer run. The writer is currently working as Research Associate at the Centre for Pakistan and Gulf Studies (CPGS). The views expressed in this article are of writers’ own and do not necessarily present the position of the Centre. Terrorism is a major national security ambiguity producer for Pakistan. The reasons for this are many and multivariate, and the more you scratch the surface, the more nuances to the problem you will unearth. Generally, the major strategic orientation for Pakistan has been the global war on terrorism, which many Pakistanis perceived as being hoisted upon Pakistan in the aftermath of 9/11. President Musharraf is widely perceived to have colluded with US in joining the GWOT in an attempt to give legitimacy to his undemocratic regime and by propping it up with American financial assistance. 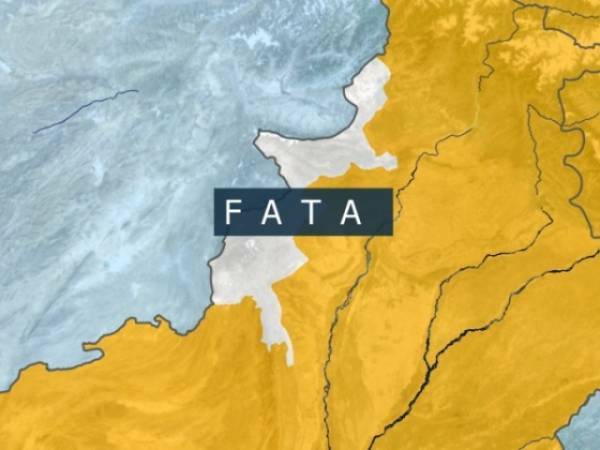 What began as tribal uprisings in FATA against this alliance of Pakistan with the US soon escalated into a full blow insurgency in Swat and Waziristans, and saw the rise to notoriety of entities such as Tehreek e Taliban Pakistan (TTP), which are now household names. Even more worryingly, extremism and radicalization has been on rise on Pakistan at an exponential level, not necessarily coupled with the post 9/11 scenario as such, but given impetus by it. Since Pakistan seems so susceptible to terrorism and extremism, there is a corresponding need to understand these phenomena in context to Pakistan. The irony is, the bigger the need, the bigger seems to be the gap in understanding. When you switch on the television in the west, perhaps the only news you will hear about Pakistan is that related to terrorism. Thus, it is not very difficult to envisage why you would be tempted to think of Pakistan as full to the brim with terrorists or extremists. You may be excused for missing the point, that perhaps there are millions of other ordinary non- violent non- terrorist Pakistanis who have not caught the attention of media because their story is not worth telling. Even Pakistani news channels relish breaking stories of disaster related events or contentious shout out loud debates, which are infinitely more entertaining than dreary stories of mundane everyday issues. When it seemed in 2009 that Taliban in Swat were about to overrun Islamabad, the Federal capital, and the world held its breath in anticipation of a Taliban central in a nuclear Islamic country. Some might still be, but they might be in for a long, maybe endless wait. Pakistan’s armies, the sixth largest in the world, have demonstrated that they can counter the Taliban’s asymmetric terrorist tactics when they have to, and are certainly no push-overs. We start hearing about how terrorism and extremism have seeped into the core of Pakistani society, but if it were true, religious right wing parties should have swept the electoral polls, a feat that they have been nowhere even close to achieving in the past, and may never do. Extremism may certainly be a fringe in the society which is arguably ink spotting towards the centre, but it is nowhere close to pervading the entire society. At the same time, as mentioned above, extremis and incidents of terrorism are on the rise in Pakistan, which is unfortunately also a reality. What then does the real picture look like? It is perhaps also true to say that the Pakistani ethos has not been subjected to intensive scrutiny which generates the murkiness around the issues. This ethos is what drives the security perceptions of Pakistan towards internal security as well as for threats from outside. I would also like to stress at the outset that it I am quite concerned about the impacts of society on culture on the Pakistani individual. I am also concerned about the impact of Pakistan’s culture and society on groups , whose basic building blocks are individuals, since the fulfillment of basic needs cannot just be an individual matter in exclusivity to the society. Leaving aside the potential for conflict within groups made up of individuals, there are a number of stresses that a Pakistani individual, or any individual for matter, will face in everyday living. Thus, how the culture dictates everyday life, relations between groups, the institutions of society, and the existence and nature and impact of local communities on the individual and families will provide a framework of reference as to how these people will live their lives. This will impact upon how basic desires and needs are met, how children are treated and in turn treat elders, will delineate the poor from the rich and how they will act etc. This will also delineate social structures and statuses of the poor and rich and their social networks. An obvious negative impact is that it may sometimes rigidly define statuses, so as to affirm or diminish people as individuals depending on social status, as has happened in Pakistan. It is a much discussed topic amongst Pakistanis who have been abroad to western societies that even the menial jobholders (as perceived by Pakistanis) such as sweepers and plumbers tend to have equal citizen status in the West. This may seem enviable as discussion topics, but as I explain later, social grouping status wise is so ingrained in the minds of even the most seemingly liberal Pakistanis that they would not willingly adapt themselves to this mindset, even if societal conditions were conducive to producing such an equitable society. Thus, there are certain cultural and societal nuances ingrained within the mind of an average Pakistani which condition him to live within the paradigms of the Pakistani society. Such conditioning is usually necessary for a person to survive within a society, in fact any society. Sometimes, as in the case of not only Pakistanis but many other societal groups as well, this conditioning can also produce a retrogressive mentality resistant to change or innovation. This will also produce a certain orientation towards security and how it is perceived. Much was promised by the government for the 2014-2015 budget, but contrary to the pledges made by PML-N government during the election campaign, they did not deliver as much as they had promised. It seems that the PML-N government is not working on the agenda of improving the common man’s life. Their policies mainly revolve around the interests of a specific community, mainly business tycoons. The government needs to focus on its actions which benefit the common people instead of mere words. The budget lacks true and fair figures and seems nothing more than manipulation. The common man was offered nothing in the budget except peanuts whereas the elites are rewarded by all means. Maintaining the past tradition, a significant increase in the budget can be seen in those areas where reduction was necessary as the budget of economic affairs (food, irrigation, forestry and fishing) is reduced by 9 percent as compared to the previous year which directly affects the life of a common man. Subsidies in different sectors affecting the common man have been reduced from 340 billion rupees to 203 billion rupees which is a huge reduction and an increased burden on the poor. This cut has been made from the energy sector which will not only result in energy shortage but also in increased prices of electricity. The common man will have to bear high tariffs. Health and education sectors have once again been ignored by the government. The government has reduced the education budget by 11 per cent. Moreover, the programmes offered by Higher Education Commission seem to be favouring the students from Punjab province only. This step will fuel the feeling of deprivation among the students from smaller provinces as the sparks of nationalism can be ignited in smaller provinces which can be capitalized by other destabilizing elements. Both these factors have a significant role in the formation of a stable and progressive society. The figure of external debt resources will increase dramatically which means foreign debt will continue to be a burden. Nominal increase of 10 per cent in the pay of government employees along with increase of only 1,000 rupees in the minimum basic wage, is not a significant step. In addition to this government should design such budget in which local industry of our country can nourish instead of promoting foreign companies as they sell finished products on much higher prices than the local suppliers. This will also help raise the living standard of lower middle class people of society. The increase of 11.6 per cent in the defence budget is due to the ongoing insurgency and threats looming on the Western as well as the Eastern side. It may be also because of the raise of 10 per cent in military budget by New Delhi. According to the finance minister, for protection of poor segments of society the government has designed National Income Support Programme which consists of Prime Minister’ s Youth programme and Benazir Income Support Programme. This step will have a little impact in a developing society. The government should introduce such packages and incentives by which the above-mentioned segments of society can live a life that leads to self-sufficiency and not making them dependent on aid and grants. Instead of doing such political stunts, the government should support cottage industry and small-scale industries at various levels. Pakistan is not in a state to bear any more experiments now. It needs proper long-term planning to achieve the dream of sustainable economic growth. All the stake holders and segments of society should be consulted in this regard. A developed Pakistan can be seen only in the form of industrialized Pakistan, and for this we will have to bolster with our energy requirements. Without improvement in health, education and economic sustainability Pakistan will never be able to achieve firm growth and will move towards darkness. Pakistan and Russia are entering into a new phase of bilateral cooperation as Moscow announced lifting of an arms embargo on Pakistan on June 2, 2014 which was imposed during the Soviet era. This step is being viewed by the relevant experts as a major development insofar as the two countries’ relationship is concerned as no such cooperation or collaboration has existed before between them. Nonetheless, it needs to be seen how the lifting of this embargo will benefit Pakistan. While Pakistan already has a sufficient arms supply chain from the United States, it is widely assumed that the quality of those weapons is better than the Russian ones. If we analyze the situation carefully, the scope of this development may not be limited to military cooperation only. It is highly likely that this development will widen the scope of bilateral cooperation between these two countries. This notable development will open new frontiers of cooperation which will primarily deal with three main domains, i.e., defence, politics and economy. This recent move by the Russian side will bolster the bilateral ties between these two states. It would act as a catalyst to improve bilateral relations between Pakistan and Russia in the coming years. It will also facilitate in establishing close professional collaboration based on mutual trust between the two militaries and in energy development and industrial sector. This cooperation will also strengthen the regional anti-terrorism efforts and maritime security. In the past, both the states have had no formal cooperative defence mechanism, and their defence ties were rather strained and more influenced by the Cold War era relationship of the Soviet Union with India. During the Cold War period, there were two global blocs headed by the United States and the Soviet Union. Pakistan was then a U.S. ally and had tense relations with the Soviet Union. Especially after the 9/11 incident, the strategic landscape has changed which has set a strategic compulsion forcing the countries to revisit their earlier foreign policies. In this context, Pakistan and Russia are no exceptions. In the post-9/11 era, the politico-military leadership of both sides paid important visits to each other’s country. In this context, the Russian Deputy Minister of Foreign Affaris, Alexander Losyukov’s visit in April 2001, former Pakistani President Pervaiz Musharaff’s visit to Moscow in 2003 are worth mentioning. The relations revitalized between the two countries when the Russian Prime Minister Mikhail Fradkov visited Pakistan in 2007. He was the first post-Soviet prime minister to visit Pakistan in 38 years. The Army Chiefs of both sides have also visited each other’s country. First, the Russian Army Chief paid a visit to Pakistan and then Pakistan’s former Chief of Army Staff, General Ashfaq Parvez Kiyani, visited Russia in 2012. This visit turned many heads as Russia’s Defence Minister cancelled his visit to India in order to receive General Kiyani in Moscow. Apparently, these past developments have brought no significant outcome as far as the relationship between the two countries is concerned. It is important to note that the recent happenings are a direct result of the afore-mentioned events that have taken place as far as Pakistan-Russia relations are concerned. It is also a poignant question as to why such a crucial decision, having strategic implications, has been taken by the Russian side to lift the arms embargo on Pakistan, at this point? It is pertinent to note that the Russian decision to lift this arms embargo has come after the Crimea episode which has been referred to by the observers as Cold War version 2.0; the echoes of the Cold War era are being heard across the globe. Experts view that in this current world order, new informal alliances are taking place, especially after the Syrian crisis when Iran, Russia and China have made it clear through diplomatic means and gestures that they will not accept any foreign interference in the entire region. The world has seen that there were tangible Western plans to attack Syria, but they changed their intentions mainly due to the resistance of and the combined pressure applied by China, Russia and Iran. Many believe the resurgence of Russia has brought a new opportunity for Pakistan to engage, initiate and enhance a meaningful bilateral dialogue and cooperation with Russia. This opportunity should not be missed as was the case during Liaquat Ali Khan’s first visit to Washington in 1950 because, according to some historians, he chose to visit Washington instead of the Soviet Union and so the opportunity to forge ties with the Soviet Union was not utilized. A pleasant and meaningful bilateral cooperation between these countries appears to be of paramount importance for regional peace and stability as a stable Afghanistan is in favour of both states. A prevailing opinion within Pakistan is that the U.S. withdrawal from Afghanistan and the likelihood of a proxy war will have a spill-over effect on this country. It has been evident in the past that the U.S. has left Pakistan to deal with the consequences as was seen at the end of the Afghan war in 1988. It is a known fact that the extremists Pakistan is currently fighting against are a by-product of that Afghan war. So, in this regard, Pakistan has a lot of concerns regarding the American withdrawal from Afghanistan. Some political analysts within Pakistan also believe that the formation of a new regional alliance consisting of China, Russia, Iran and Pakistan would have great potential in stabilizing the region in the post-2014 scenario. Moreover, Russia can play an instrumental role in preventing a vacuum formation in Afghanistan. It is of significant importance that Pakistan needs to be on the same page with all neighbouring countries of Afghanistan to the extent post 2014 Afghanistan is concerned. Pakistan and Russia are nuclear weapon states. Russia can help Pakistan by providing its support in this domain just the way it supported India by leasing it a nuclear submarine in 2011 which was formally commissioned into service by the Indian navy as INS-Chakra in 2012. If Russia and Pakistan can strike a deal on the procurement of the Russian Mi-35 helicopters, which are currently being negotiated between the two countries, it would be a huge leap forward in their relations. Pakistan and Russia have a huge potential in the field of trade. Russia can utilize Pakistan’s southern waters for trade and shipping. That will help increase Pakistan’s bilateral trade volume with Russia many-fold. Pakistan’s infrastructure will also improve if Pakistan provides Russia with this trade corridor in case these plans materalise. An example of Pakistan steel mills is in front of us which was established with Russia’s assistance and has proved to be one of the most important strategic assets for Pakistan. Russia can help Pakistan in the energy development sector as it has the relevant expertise and technology. During the past few years, Pakistan has been facing an intense energy crisis which has directly affected Pakistan’s economic growth. Pakistan’s energy sector can provide a huge potential for establishing collaboration between Pakistan and Russia. Russia can not only invest in Pakistan’s energy sector, but Pakistan can also reap benefits from Russia’s vast experience and expertise in the fields of oil and gas exploration. Pakistan can utilise Russia’s influence in Central Asia to garner future energy collaboration with the Central Asian Republics (CARs) as it will not only benefit Pakistan’s energy needs but also provide the CARs with a new market. Moreover, an agreement with Russia’s Gazprom (Gas company in which Russian government has major stakes) can prove to be of vital strategic importance between the two countries. In a nutshell, Pakistan and Russia have a huge unexplored potential in their relationship. It is quite evident that Islamabad is not oblivious to the resurgence of Russia and, meanwhile, a strong realization of Pakistan’s geo-strategic location and importance also exists in Moscow. It is the need of time that the two countries formally channelized their bilateral cooperation and explore further avenues of mutual importance to the maximum. The lifting of the Russian arms embargo is a significant step, but it should be kept in mind that this step is not an end in itself; it should rather be viewed as one of the many steps to come. In the rapidly changing international environment, Pakistan’s defence planners are confronted with a number of fundamental issues that mainly emerge from some transitions at the national, regional and international level. The expected drawdown or total military withdrawal of American and NATO forces from Afghanistan and the new American strategy of ‘Asia Pivot’ clearly indicate that a relative shift in the balance of military power in Asia is undoubtedly underway. This shift amidst tensions and disputes in the region will result in hefty defence budgets and military developments and procurements at a much larger scale by the Asian States than was the case earlier. According to the International Institute for Strategic Studies’ military balance report of 2014, Asian defence spending in 2013 was 11.6 per cent higher than in 2010. In one way or the other, the game of power has begun in Asia; and Pakistan, because of many reasons, is not in a good position as far as defence and security are concerned. There is a three-layered problem, which becomes more complex, more unpredictable and more unanticipated, when the forces at these three layers interact which each other. At the outer-layer, due to a relative shift in the balance of military power to Asia, the Asian countries are rapidly increasing their military capabilities, some of which are generally related to routine force modernization, and others for enhanced power projection, or deterrence. A chain reaction that starts from the accumulation of American military forces in the region and a circle of alliance around China to contain it under the so-called ‘Asia Pivot’ strategy fuels systematic military competition that drags India and Pakistan in. China’s defence spending rose 7.4 per cent in 2013 as compared to 2012, and India has been marked as the largest arms buyer state in the world. This upward shoot in Indian defence developments and acquisitions are not aimed at security but the projection of Indian military influence in Asia. The development of an Inter-continental Ballistic Missile (ICBM) like Agni-V reflects the Indian hegemonic future designs. The BJP has won the Indian elections and in its election manifesto, stated a commitment to indigenise the development of defence technologies through encouraging domestic industry to have a larger share in design and production of military hardware for both domestic use and exports. According to some reports Narendra Modi is likely to spend an additional $200 billion on stealth fighters, main battle tanks, backfire bombers, aircraft carriers, frigates and Scorpion submarines. Pakistan’s security dilemma runs along this uncontrollable systematic problem, where it has to balance between its socio-economic development and security. But a blurred and chaotic picture makes it difficult to strike a reasonable balance between both these continuums. At the second, regional level, Pakistan is facing a three-front problem. On the east, India with its rapidly increasing military might, offensive military doctrines and new right-wing government. In the North West, an unreliable and presumably unstable Afghanistan because of a possible civil war after the NATO drawdown and along its western border, the deployment of Afghan National Army (ANA). Finally at the third, national level; rising militancy, separatist violent movements and a conservative political right-wing, pose the single biggest challenge to Pakistan’s internal security and integrity. Pakistan has suffered the loss of more than 40,000 lives and economic losses of more than $100 billion. To overcome these challenges, Pakistan needs to work at two levels. At the strategic level, it needs to take into account the changing strategic scenarios and their implications on Pakistan’s security, and then take appropriate measures to deal with them. Nuclear weapons play a vital and central role in this regard. Though the likelihood of a large-scale conventional war between India and Pakistan has become obsolete because of nuclear deterrence, Indian intent to fight a limited war under a nuclear threshold, development of second-strike capability and ballistic missile defence and bringing in military doctrines like Cold Start Doctrine (CSD) or Proactive Military Operations (PMOD) in South Asian strategic environment, have forced Pakistan to revisit its strategic and conventional development postures. Pakistan has responded with the development of short-range ballistic missiles such as NASR and cruise missiles such as Babur to fill the gaps at the tactical and operational levels. However, to strengthen the structure of strategic stability, Pakistan needs to develop its sea-based nuclear deterrence capability, along with multiple independently targetable re-entry vehicles (MIRVs). At the conventional level, Pakistan needs to enhance its counter-insurgency capabilities, along with effective security of the western border along Afghanistan. To this end, adequate budgetary allocations are needed for training and procurement of equipment for conventional operations and fencing and building of more check posts along the Afghan border. In addition, the capacity and capability of intelligence agencies for accurate and timely detection of threats needs to be enhanced. Investing more on counter-insurgency training and early and accurate intelligence gathering will greatly reduce the fatality rate during future counter-insurgency operations. Also, the most important area to focus on beyond enhancing our kinetic capability is to increase our non-kinetic capabilities. Effective non-kinetic operations with limited and well-calculated kinetic operations will result in early and effective elimination of threats. Pakistan’s defence procurements have remained constant in five years before 2013. However, after that, Pakistan increased its defence spending by 15 per cent, from $6.12 billion to $6.45 billion in 2013-14. Whereas, in India, there has been double digit growth in 2004-05 (17.92 per cent), 2008-09 (10 per cent), 2011-12 (11.59 per cent) and 2012-13 (17.63 per cent). Analysis of the statistic testifies the fact that India has regularly enhanced the defence budget substantially, whereas in the case of Pakistan, it has remained more or less constant. In fact it does not even cater for inflation. Pakistan’s defence allocations have been at the lowest as compared to the rising defence budgets of India, China and Turkey. There has been a lot of criticism on the defence spending of Pakistan, but if we see Pakistan’s defence budget against its defence requirements in the backdrop of the threat that Pakistan faces, there is a huge disparity between threat and security. There are geo-political realities which can’t be ignored and it is important for Pakistan to ensure its security, safeguarding its territorial integrity and sovereignty. The budgetary allocations for defence have been kept lowest in the previous few years. However, the changed national, regional and global security environment does demand an increase in our defence budget; appropriate fiscal allocation is required to meet the country’s defence needs. In this regard, a thorough review and analysis is required to outline the defence budget for 2014-15. In this process, various defence and strategic institutions should be involved to fully grasp ground realities. In the same vein, the political leadership should also play its due role in strengthening the defence and security structure of the state by understanding geopolitical realities and realizing the responsibility that people have put on their shoulders. The writer is the President of Centre for Pakistan and Gulf Studies and Member Senate Standing Committee on Defense, Foreign Affairs , Overseas Pakistanis and Human Resource Development and Functional Committee on Human Rights.